The root canal is the hollow part of a tooth root which is filled with nerve tissue. When decay or injury cause this nerve tissue to become inflamed or damaged, moderate to severe toothaches can occur. Once your teeth are fully developed, the nerve tissue is no longer necessary, and can safely be removed to eradicate the source of discomfort and preserve the natural tooth. This process is often referred to as root canal therapy, or just a root canal. Though this may sound hard to believe, getting a root canal is good news. 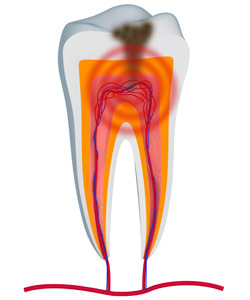 Root canal therapy alleviates severe toothaches and prevents future infection. Thanks to the latest technology used at our Manheim dental office, a root canal treatment is more painless and more efficient than ever. Depending on the patient, a root canal may only take one or two visits to restore your teeth to their optimal state of oral health. PAIN FREE | Once you have completed your root canal treatment, your pain and discomfort should be gone forever. The issue causing your toothache is the infected nerve pulp. We make sure your tooth’s root canal is completely clean — which means no more signals to you body causing you discomfort. STAY NATURAL | Another tremendous benefit of root canals that most people don’t know about is that a properly done root canal treatment allows you to keep your natural tooth instead of needing the tooth to be extracted. This means you can still have a healthy, natural smile without needing a prosthetic tooth or dental implant to fill in a smile gap. Most dentists would agree it’s almost always better to keep your natural teeth, if possible. If you are suffering from extreme pain or sensitivity in a particular tooth or area of your mouth, you may be need a root canal. Call White Family Dental today at 717-879-9700 to find relief from your tooth pain.